Task descriptions are a means for designers to delineate and understand the tasks the user performs. Task descriptions are written by the designers and can be shared with the client to insure that designers understand the tasks well. Task descriptions can also be shared with the programmers to help design the software. Because of the many uses of task descriptions, the descriptions can have many forms varying from informal descriptions of typical scenarios accomplishing goals to formal step by step descriptions using software. We’ll introduce three types of task descriptions: Scenarios, Use Cases and Hierarchically Task Analysis. Tom is driving the car by himself. He feels lost and thinks, “Where do I turn next?” He grabs the map by the seat next to him and thinks, “What road am I on? Oh highway 41. Where do I turn next?” He stops the car on the side of the road and examines the map and thinks, “Let’s see, I am to turn right on Hill street.” He pulls the car back on the road and continues. Notice that both scenarios do not describe the technology being developed; rather they describe how the tasks are performed currently. The scenarios delineate the stakeholders or actors, for example what kind of stakeholder is Alice? They describe the environment and circumstances, for example what is the difference between of circumstance of Joe and Tom. Most important they invite thinking about improvements and solutions to any difficulty. Have the scenarios given you ideas about design for the GPS system? What are the trade-offs between the designs? Note the scenarios become more and more explicit about using the propose system and developing the design. Several scenarios are written at each stage of the design. The scenarios should encourage discussion. Designers delineate claims and trade-offs. Nominal interaction scenario combines Information and Interaction Scenarios. They describe the typical use of the app without errors. I propose using them early in small projects. They can give you quick and detailed view of the interaction that you can design against. The nominal interaction scenario can be extended to include the secondary stakeholders. Because squads need to know the general location of reconnaissance and specific goals for the mission, the commander uploads missions’ locations and goals to web server. The field sergeant distributes the missions to his field soldiers. The field soldier selects the Army App and view general instruction and mission goals. After reading, the soldier views the navigation screen in order to travel to their destination. In the proximity of the reconnaissance location, the smart phone gives an alert and displays the specific instructions for the reconnaissance, for example describing the exact location. The soldier selects the appropriate incident type and the smart phone saves the incident type, associates it with the incident id. The solider then select notes and a text input field is displayed with a keyboard. The soldier keys in text. After touching the “save” button, the system saves the texts and associates it with the incident id. The system displays the new recon view. The soldier selects the “save incident report” button. The system displays the navigation view. The soldier moves to the next recon location. After visiting all the recon areas and repeating the above process of documenting the incident, the soldier press the “return to base” button on the navigation screen and travels to the base. At the base, the soldier uploads the incident base to the server. The commander reads the incident report and perhaps maps them. The nominal interaction scenario attempts to give as detailed a description of interacting with the system. Note that it describes more than the primary users interactions: the secondary user, the sergeant’s use is described; also it describes the use of the secondary stakeholder, commander. The nominal interaction scenario gives only a vague description of the app’s view. Note it misses some. Where are the holes in the above description? What views are missing? Asking these questions lets your group progress with the design. Use cases diagram are used to briefly display interaction between actors and uses. Use cases focus on the technology. They are good for refining the technology. For example how can the process for the classroom be streamed lined? Use cases can also cause confusion in developing the metaphor. For example suppose that a professor wishes to find the classroom for a course that he is teaching. What must he do? Finally, use cases are not much help in conceiving new technology. Users have goals and break up the goals into sub-tasks and finally into actions. It is important for designers to identify the users’ goals, but the process of achieve goals (tasks) should not be ignored. There may be more in the process of accomplishing the goals than the designer suspects. Also the designer can make the process better. After identify the goals and tasks, the designer can get a better understanding by performing the following analysis. Workflow Analysis chronologically follows the job from person to person. For example, how are grades distributed at school? Job Analysis follows a single individual through their daily job. For example what is the work day for a department secretary or a professor? The granularity of the list is a choice the designer must make, but 500 tasks maybe too many to manage, yet 10 may not give enough information about the overall task. Task sequence is the chronological order to perform the task. There maybe more than one order, for example how many possible orders for mailing the letter? The Nominal Interaction Diagram (NID) is chronological list of actions. It shows interactions (pair of actions) and the relationship between major stakeholders. There are columns for the important stakeholders: primary and secondary users, and secondary stakeholders. The system, in our case the app is a column in the NID. Entries describe the actions that the stakeholders perform. Arrows from the actions delineate the recipients of the actions. Actions are listed chronologically depicting error free interactions. It can follow the nominal use scenario. 8 <– download mission spec. 15 Alert, display spec. info. Numbering rows representing actions lets you delineate the specific actions. The NID can be used to anticipate errors. Included with the hierarchical listing are plans, which specify the task process. 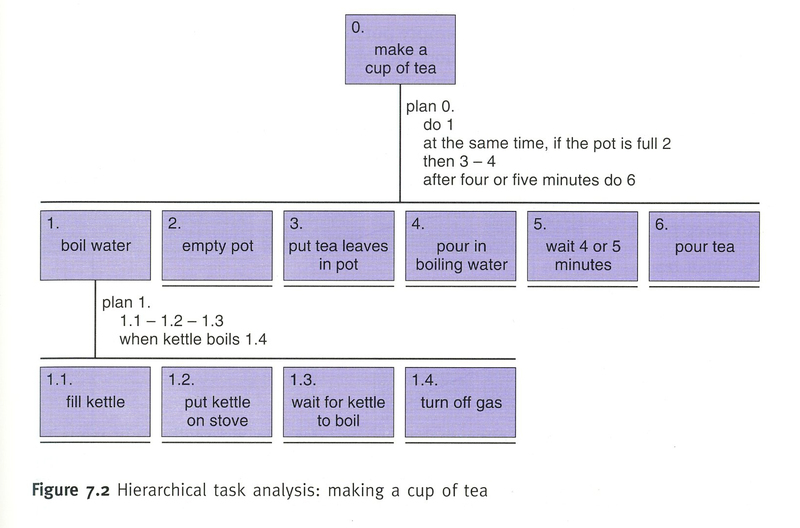 Plans are associated with the higher level task. The Graphical display resembles organizational charts with plans appearing adjacent to vertical lines sub dividing the tasks. The charts can get large or the lists long; even in this simple example task 1, get billing list, should be further subdivided. The process can become involved and tedious. Nevertheless the designers should list major tasks, and they will find themselves specifying the higher level task by listing sub tasks. Essentially the designers are reproducing the HTA structure. Plans are hard to specify but they are useful for identifying important or work intensive tasks, alerting the designer to reconsider the task process. In the above example the designers should include functionality to automate plan 2 in the billing applications. The simplified HTA shows the hierarchy with indentation, but does not number the tasks or sub tasks. Plans are not specified. The simplified HTA is not trying to model the user; rather it is trying to delineate the task associated with each view in the app. Extending the hierarchy to more than three levels becomes difficult to read. A better structure is to the divide the views into upper and lower level views, as shown above. The indented sub-tasks below a view/task can represent buttons for tasks or navigation to new views. You can examine the views to determine if it is possible to navigate between views. Also, you can examine the views to determine to if all the activities are specified. Ethnography and visiting the work place is popular way to learn about users and their goals. Activities of the work place including identifying the personnel. Artifacts of the work place such as information (used and created) and tools. Social context of the work place, identifies group organization and roles of individuals. The three dimensions of the work place are good aspects of the work place to consider while learning the users’ work. We can learn much about how a sculptor works by studying a sculptor’s tools. The mass and size of the hammers reflects the material the artist is working on and the level of carving detail. How the tools are arranged in a well organized shop is determined by the carving process or sculptor’s preferred techniques. The material that the sculptor works in (i.e. stone, wood, plastic, etc.) not only determines the final sculpture but the process. Naturally learning about the sculptor’s work we would be amiss not to identify the final product. Sculptors producing figurative statures and tombstones have different concerns. Identifying the artifacts (materials, tools, and sculptures in this example of the sculptor’s work) helps us learn the process. The work place artifacts identified by the designers are frequently more abstract. The artifacts may represent information, databases and applications in the computer. Nevertheless we should not ignore the physical artifacts; a dictionary on the desk should suggest that the user frequently references it for spell checking, definition or some other use. The designer should identify the clues and ask the user about their use. Random House: ethnography ~ a branch of anthropology dealing with the scientific description of individual cultures. If possible, the designer should visit the work place to identify the users, activities, artifacts and social context of the work. Rosson and Carroll recommend a technique used by ethnographers which involves the ethnographers personally in the tasks and customs of the tribe; the researcher speaks the local language and participates in the normal activities of the tribe. Ethnographers’ goals are not only to acquire a deeper understanding of the culture but also the trust of the people. Designers can benefit by using the same techniques, but the value of insights may be directly proportional to the amount of time spent. Also if the designer identifies too strongly with the user, the designer may lose the perspective of an observer, which is also valuable. A user frequently is too involved or habituated in the work to identify radical or subtle beneficial changes in the work place or process. Nevertheless a user will always have ideas to improve the user’s work; these ideas are valuable if not to suggest a solution, then to indicate a problem in the work place. Asking users or workers how they perform their tasks frequently does not give the results that designers need. Users may not describe what the actually do or think, rather they describe what they want or think should happen. Observing user may not give sufficient insights to what users are thinking while they are working. There a few standard techniques for eliciting what users are thinking. Think Aloud: The user keeps a running commentary of what they are thinking while they are performing a task. The designer records the user’s vocalizations. This may seem awkward for the user, but after practice they can become very proficient and forget that they are being recorded. Sometimes the designer may have to prompt the user to keep talking by saying, “What are you thinking?” Psychologists perform a very formal analysis, but designers only need to get ideas from the commentary. Role Play: Sometimes used for tasks that occur infrequently and can not be immediately observed. The designer and the user can play roles, and the designer can ask questions during the role playing. Cueing Recall with Video: An elaboration for Talk Right After is to use video recordings to help the user recall the event and what they were thinking.